With this decision, Washington is scrapping the entire nuclear arms control framework that emerged from the Cold War. In 2001, Washington repudiated the 1972 Anti-Ballistic Missile (ABM) treaty, so it could begin working on a “Star Wars” anti-ballistic missile system to shoot down enemy ballistic missiles. Now it is scrapping the 1987 treaty that bans US or Russian manufacture and deployment of nuclear missiles with ranges of 500-5,500 kilometers (310-3,420 miles). For the first time since 1972, there is to be no treaty limiting the major powers’ deployment of nuclear arms. 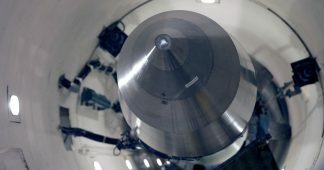 Washington is aggressively stoking a nuclear arms race, with Russia and China first in its gun-sights, which would provoke stepped-up missile deployments across Europe and East Asia. It points to the immediate and growing risk of nuclear war between the major powers. Ryabkov said he would discuss it with US National Security Advisor John Bolton, who supports killing the INF treaty. Bolton arrived yesterday in Moscow for two days of talks starting today. Trump’s attempt to blame Moscow and Beijing for his decision is a transparent political fraud. 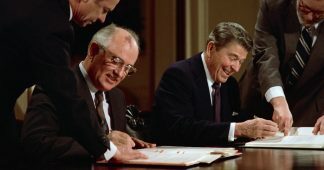 The US repudiation of nuclear arms control treaties is part of a longstanding, aggressive foreign policy aiming to exploit US military supremacy in the aftermath of the Stalinist dissolution of the Soviet Union to counterbalance the effects of its accelerating economic decline in world affairs. The 2001 repudiation of the ABM treaty was part of the Bush administration’s turn to war, including the illegal invasions and occupations of Afghanistan in 2001 and Iraq in 2003, to dominate the Eurasian landmass. The Democratic Party escalated this policy, launching wars in Libya and Syria while initiating a “pivot to Asia” to confront China in Barack Obama’s first term. In his second term, together with its European allies, Obama backed a far-right coup in Ukraine that toppled a pro-Russian government and provoked an all-out military confrontation with Russia in Eastern Europe. Washington and its European allies have deployed tens of thousands of troops on the very borders of Russia. The coup in Ukraine and the resulting escalation by Washington and the European imperialist powers in Eastern Europe set the world on course towards nuclear war. 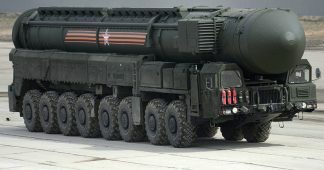 Amid the NATO military build-up against Russia, Washington first alleged in July 2014 that Moscow was developing a ground-launched cruise missile system violating the INF treaty. Recently, on October 2, US Ambassador Kay Bailey Hutchison took the extraordinary step of threatening to bomb Russia to “take out” these missiles, after again denouncing Russia for violating the INF treaty. It is not Russian but US aggression that is driving Washington’s decision to scrap the INF treaty. In fact, powerful factions of the US military and foreign policy establishment have been campaigning for years to scrap the INF treaty—not because of Russia, but to threaten China. After Obama launched the “pivot to Asia” in 2011, Beijing sought to develop intermediate-range missiles capable of hitting US aircraft carriers and military bases in the Western Pacific, to deter Washington from using them to attack China. 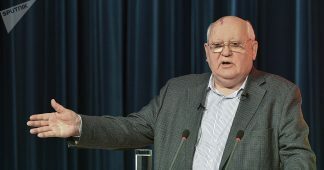 As the balance of power in that region shifted ever more in China’s favor, voices in US ruling elite began to call for scrapping the INF treaty, using tensions with Russia as a cover for a policy designed to target China. 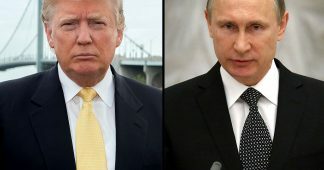 Is There Any Point to a Trump-Putin Meeting for Now? 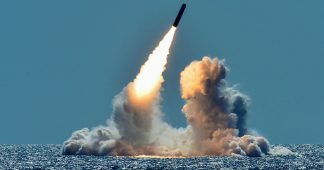 Washington’s repudiation of nuclear arms control as it seeks to maintain global military dominance is a warning to the working class in America and worldwide. With the major powers pledged to spend massive sums on their arsenals of missiles and nuclear warheads, led by Washington, who pledged in 2014 to spend $1 trillion to modernize its nuclear arms, untold social resources are being squandered on creating conditions for a nuclear war. Governments internationally are determined that the costs of this insane policy are to be borne by workers, through austerity and attacks on living standards. The construction of an anti-war movement based in the working class is a critical necessity, objectively posed by the rapid development of the danger of wars that could end in a nuclear conflagration. Begin New Strategic Talks with Russia!